It has recently come to my attention that I may need to share some old educational posts for the benefit of newer readers. I tend to cover things a few times, then sometimes it simply doesn't cross my mind to cover them again (presuming everyone has gained collective knowledge from the past). Most recently, for the past few months while we rallied, I warned everyone (repeatedly and often) that the rally had all the hallmarks of an extended fifth wave. Then when we turned lower, I gave warning that the correction should have legs, and simply presumed that everyone remembered all the things I've said in the past about what happens after an extended fifth wave ends. I have recently realized that I probably should have gone into more detail, especially for the benefit of new readers. 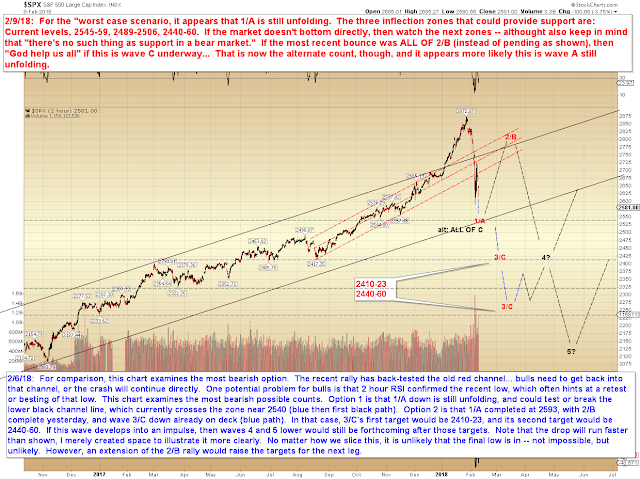 The expectations of Elliott Wave Theory are for the "rapid retrace" of an extended fifth wave. Extended fifths work like this: Just when you think the fifth wave is about to complete, it launches in a parabolic. They are completely out-of-whack with the rest of the wave structure -- often fifth wave extensions run a distance equal to 1.618 the length of waves 1-3 combined. This convinces most Elliotticians that the wave count is something else (normally, they assume it's a third wave). This then creates a situation where they're looking for fourth and fifth waves to unravel when actually there are none left to unravel. Further compounding that issue is fifth wave extensions often peak on high momentum, which leads classic technical analysts to continue looking for higher prices. As a result of these issues, extended fifths often catch people looking the wrong way on the way up, then looking the wrong way again on the way down. Calling extended fifths is difficult, because the technical indicators literally don't work -- so it's all about "feel." 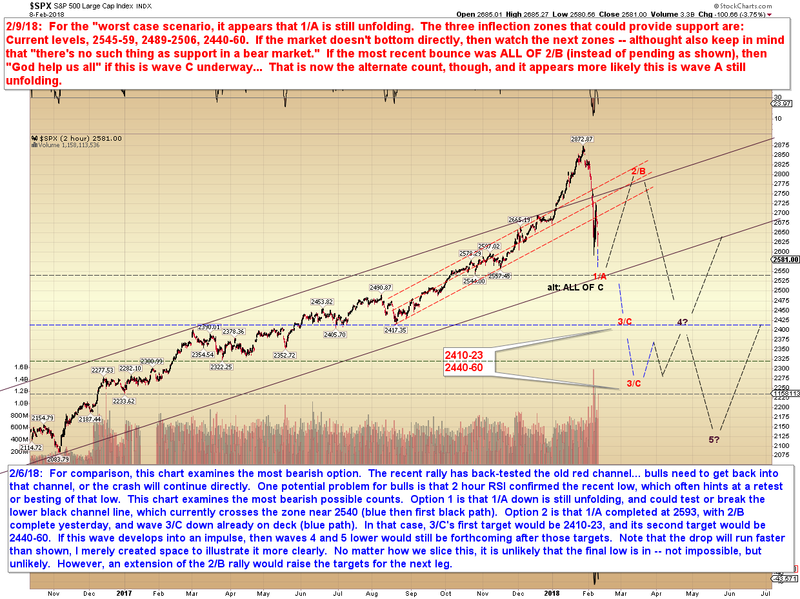 When an extended fifth wave forms, we know to expect a rapid retrace to wave iv of the extension. This is usually followed by one or more retests of the wave-v price high/low. Then, after the retests, the next wave will typically retrace to wave-ii of the extension. The extended fifth would allow a possible "resolution" higher, if it occurs, and could prelude a much larger correction. Most recently, the following was posted on January 17, 2018. Note that I mentioned that the textbook target for the rally was 2869-71. The exact all-time high was 2872.87. In conclusion, the market appears to be in the midst of yet another extended fifth, this one having begun at 2792 SPX. 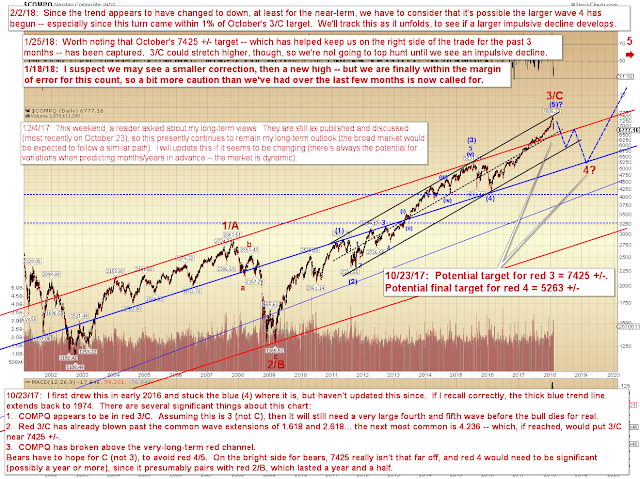 The textbook target for this wave would be 2869-71. Here's another thing about extended fifths: Because they are fifth waves, they set off everyone (even non-Elliotticians) "topping signals." But because they extend, they then blow right through those signals and leave everyone who wasn't wise to the potential of an extension scratching their heads. And missing out -- or worse, losing money being wrong-footed. We've been wise to the extended fifth for the past several months (and past several hundred SPX points), and it has saved us countless dollars of loss, and earned us significant profit. While Elliott Wave is my go-to market tool, I have been doing this long enough to (sometimes, not always) recognize when a wave is extending (as I did in this case), and when that happens, you pretty much have to throw almost every technical system out the window for a time. Technical systems, just like fundamental systems, are based on the past and the "average" performance of the past. Extended fifth waves are outliers, though, so they render "averages" pretty useless. The point I'm getting at is that while I know everyone wants to see wave counts, there's a time for that, and there's a time to simply let the market lead while you just go along for the ride. We are now in a larger inflection point, as shown by last update's long-term COMPQ chart -- but unless and until the market gives us a signal that it's done extending (in the form of an impulsive decline), we're just going to keep riding along with it. Then, the instant the market reversed, I saw it as likely that an impulsive decline was forming (even before it had technically completed as an impulse). The preferred count was favoring lower prices, and, as I had promised during the past few months, I immediately warned bulls to stay away. Probably the key point to absorb from all this, though, is that this is the first time in months that we've seen a correction that looks like it may develop some meat to it. "Bears' Turn -- Bulls Should Stand Aside for Now"
I'm not certain how much clearer I could possibly have been. Again, the title said it all, and I don't believe I can be any more unequivocal than that. 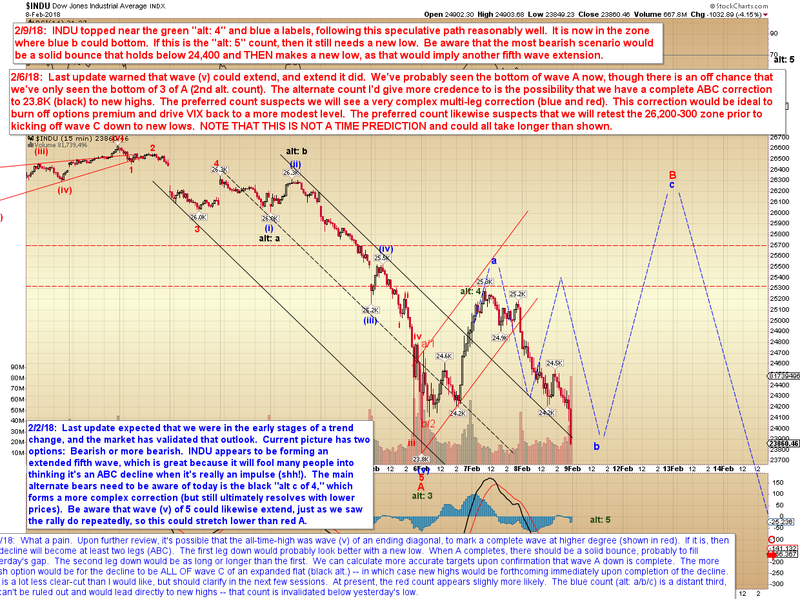 In each update, I warned that bears had the ball and all-but dismissed the bullish options as highly improbable. Analysis is all about probabilities, not certainties, so I usually tend to caveat quite a bit, because I'm far from infallible. But in this case, I felt I conveyed things with more certainty than should ever reasonably be expected in a probabilities game. I'll admit, this went a bit faster than I was initially envisioning, even despite what I know about extended fifths; I'm not omniscient and don't know exactly what the market's going to do every minute of every day. But it's worth mentioning that on the morning of Friday, February 2 -- at 9:52 a.m. (before everything got really rolling on the downside) -- I posted in our widely-read private forums that a mini-crash was entirely possible from there. A little later, I even posted my target of 2759 for that day's low, and (somewhat to even my own surprise, because that target was pure instinct, not math) 2759 ended up being the exact low of the day. On Monday I posted my real-time short entry within a few points of the high of that day, and then kept our forum readers looking lower throughout the session, including into the big crash bar. I exited the last of my shorts within a few ticks of the bottom, then posted my exit on the forum immediately before the market embarked on a massive bounce. In the most recent update, I posted my "best and worst case scenarios," both of which led to new lows. And we've already made new lows. Anyway, I don't hit every move perfectly -- but I can't call a move much better than I've called this one. Next up is the SPX "worst case scenario" chart. It appears that either I was premature in thinking wave 1/A was complete... or we're in for a monster crash of 25-30%. In conclusion, we've reached an inflection point on several levels. Crash waves are always a challenge, especially since we've reached a potential bottom zone -- but we do have some price points and signals to watch heading forward. Trade safe.